I have been loving the whole “pie in bar form” this summer. It really just does make sharing much easier! 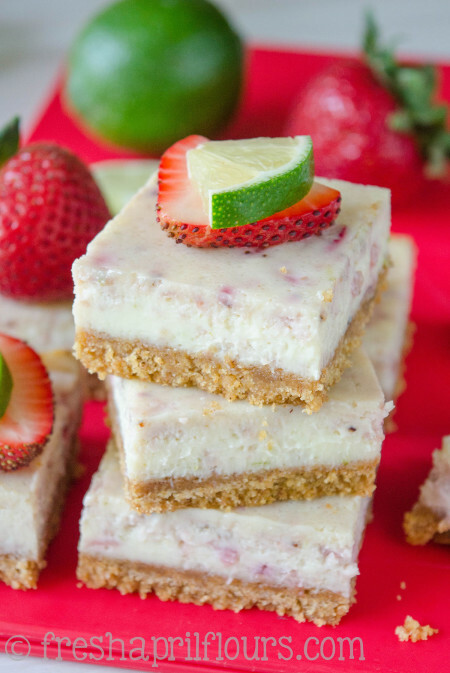 Not to say I won’t be venturing into the pie-in-a-pie-dish soon (especially so I can cross a couple things off of my list), but for parties with lots of people enjoying dessert: pie bars are the way to go! 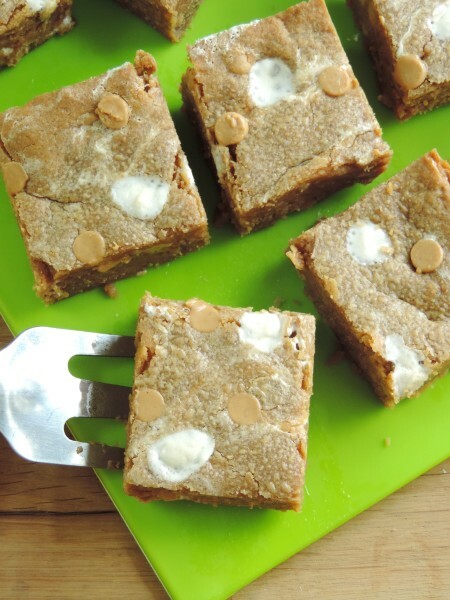 I originally whipped up this recipe for the party that I took my fluffernutter bars and key lime pie bars to, but I wasn’t completely sold on them. Don’t get me wrong, they were delicious, but they were a bit too sweet for my liking, and I thought they needed some sort of topping– not quite a streusel but not a crust either. That’s why I have taste-testers, people (and I’m always looking for new tastebuds)! This bar starts with a shortbread crust. 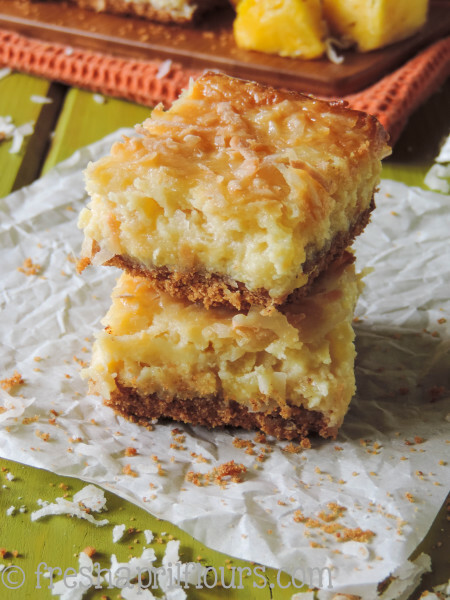 One of my absolutely favorite food bloggers put out a cookbook in March and this crust is featured on her lemon bars. As I was perusing her cookbook one day, I made sure to mark the page, because the crust sounded so good. Once I tried it, I was in buttery love, and I actually didn’t feel I wanted to alter it at all (which doesn’t happen to me a lot). The only thing I changed about it was adding the lemon zest. You can find her cookbook here. You’re actually going to reserve some of the shortbread crust for the topping. Once the crust is all mixed up, you’ll remove 3/4 of a cup, pop it in the fridge or freezer (because it has melted butter in it and will be quite soft), and once you’re ready to use it, it should be nice and easy to crumble over the top. If necessary, you can separate into crumbs with a knife or fork. I sprinkled a little extra sugar on top, just for some sparkle and a little added sweetness. 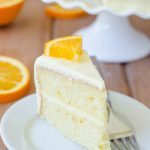 For this recipe, I used Meyer lemons. 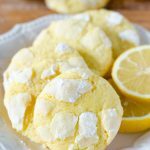 If you follow me on Instagram, you know I was in search of Meyer lemons a few months ago. 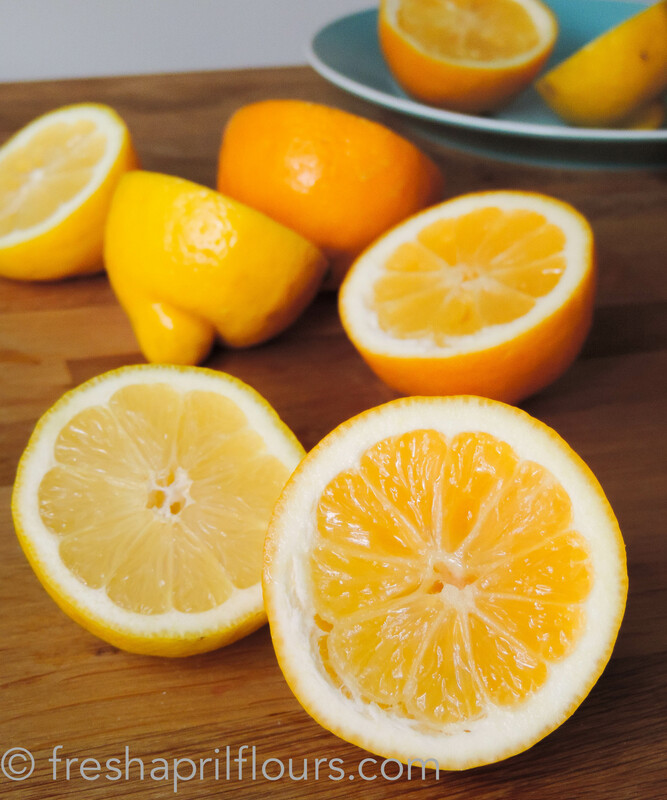 Meyer lemons are a cross between a regular lemon and either a regular orange or a mandarin orange. 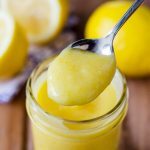 Although still tart, the tartness is a bit muted and replaced with a sweeter and fresher taste of orange. 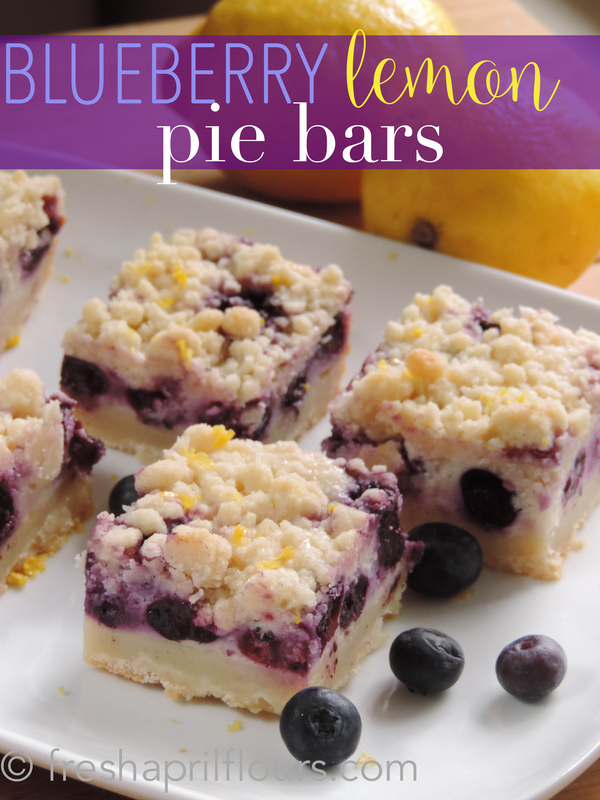 They’re really quite delicious and add a nice citrus tone to the sweet blueberries that stud these pie bars. You may certainly use regular lemons. They’ll be just as tasty! I found Meyer lemons at Wegman’s. 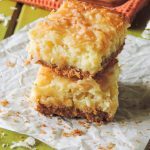 While this recipe uses some cream cheese for the filling, it’s not quite cream cheesy enough to be called a cheesecake. You’ll use a container of lemon Greek yogurt and some flour to make more of a pie filling, but rather than being a gooey filling with blueberries spilling out all over the place, the cream cheese holds everything in place so this pie becomes portable and dish/silverware free! I used half fresh and half frozen blueberries for this batch. 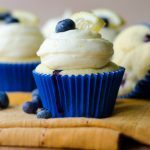 Either will work for the entire amount in the recipe, I just prefer the way the frozen ones look– they give a burst of purple to the filling surrounding them. I actually added about a dozen frozen blueberries to the top along with the crumbled crust just to add some extra color. For the topping on these bars, I used Sugar In The Raw, but you can certainly use regular granulated sugar. The raw kind just adds more of a crunchy sugar, since the crystals are so big. You’ll want these to cool in the fridge for a little while before you cut them. 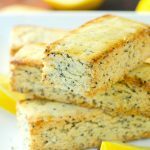 A little lemon zest added right before serving, and these sweet and citrusy bars are ready to enjoy! That buttery crust is really something special, and since the bar is kind of “sandwiched” between two layers of it, it’s a complete win-win for you and your tastebuds. 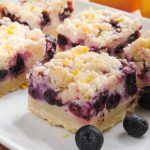 These bars just get better over time, as the zest you sprinkled on top infuses into the crumby topping, and the blueberry juice has more time to sit in that creamy filling. Although these only lasted 2 days around these parts, they’re good for at least 5 (I challenge you to make them last that long). 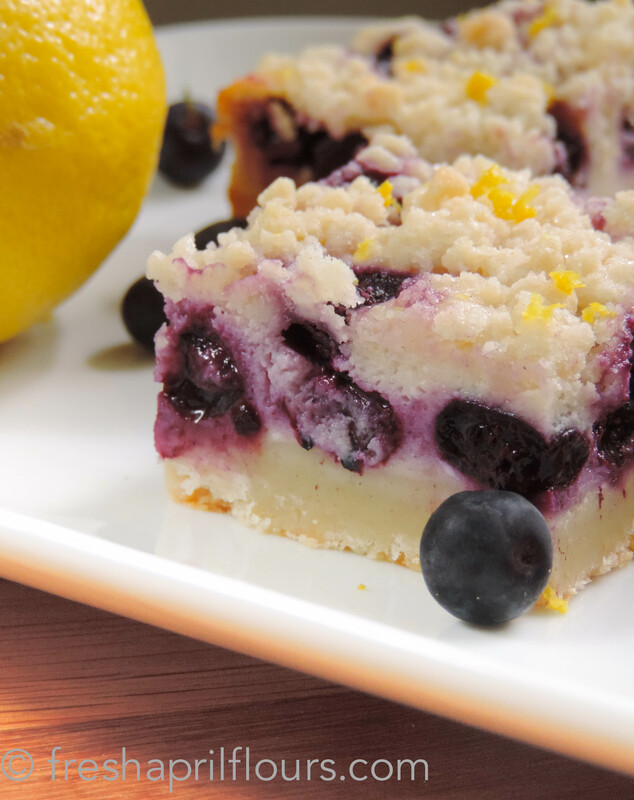 Seriously… Are those beautiful blueberries calling your name yet?? Preheat the oven to 350ºF. Line an 8″ x 8″ or 9″ x 9″ baking pan with foil. Leave an overhang on the sides. Set aside. Stir the melted butter, granulated sugar, vanilla extract, salt, and half of the lemon zest together in a medium bowl. Add the flour and stir until combined. Reserve 3/4 cup of the shortbread crust and place in the refrigerator or freezer until needed. Press remaining crust evenly into the prepared pan. Bake for 18 minutes while you prepare the filling. In the bowl of a stand mixer fitted with the paddle attachment, or in a medium sized bowl with a hand mixer, beat cream cheese on high until smooth. Beat in eggs, scraping down the sides as necessary. Add sugar, yogurt, remaining lemon zest, lemon juice, and salt and beat again. Add flour and beat one more time until just combined. Gently fold in blueberries with a spoon or spatula. Pour filling into prepared crust and add a few blueberries on top of filling. Remove reserved crust from refrigerator and crumble over top of the filling (you may need to separate into crumbs with a knife or fork). Sprinkle with coarse sugar, if desired. Bake bars for 55-60 minutes minutes, or until a toothpick inserted in center comes out mostly clean. Allow bars to cool at room temperature on a wire rack. When completely cool, chill in the refrigerator for 1 hour. When bars are completely chilled, lift out of the pan using foil overhang and cut into squares. Top with lemon zest before serving, if desired. Bars can be stored covered in the refrigerator up to 5 days. I pinned you today Lynn! These look amazing!! I don’t know about licking my computer screen, but I am drooling all over my keyboard. My goodness these look delicious! I have just made an executive decision: these will be my bring to work treat for my co-workers on Monday. Gotta share the love, right? Thanks Lynn for posting! Oh goodness, no! Have at it! I would like to use your chai cake recipe (if you haven’t seen that comment yet about replacing the flours with all purpose) and do the same! These are SO pretty! The recipe sounds scrumptious. ;-D I have never bought Meyer lemons. Cannot wait to try this. Thanks, Michele! I think you’ll be pleasantly surprised by the Meyers. Do yourself a favor and throw one in some water to get the true taste before you combine it with all this other stuff! 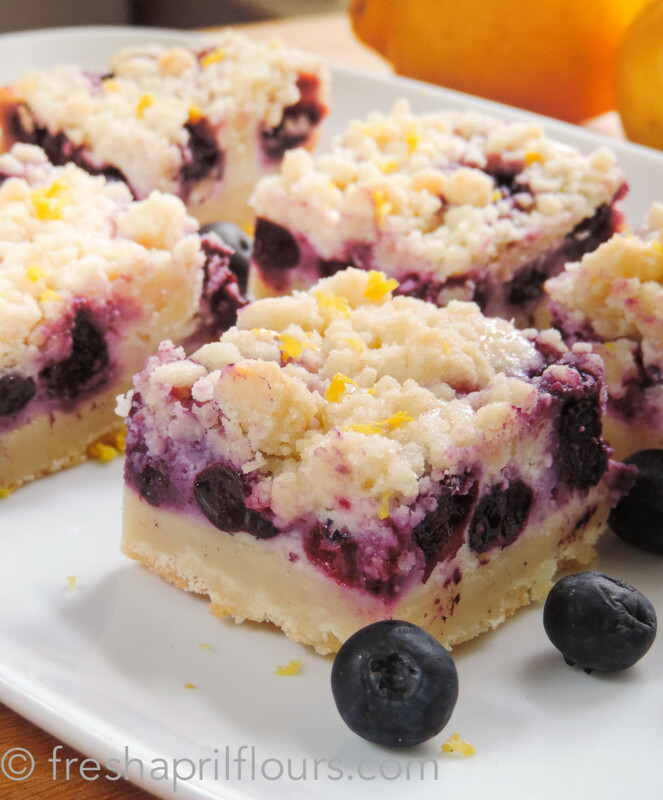 Those meyer lemons are gorgeous, and so are these bars! I’m seriously obsessed, and I love that you added crumbs! They make everything better! Crumbs really do make everything better! In my opinion, they’re akin to sprinkles, haha. Thanks for stopping by, Cate! What gorgeous little pie bars! 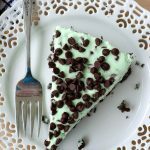 I’m a HUGE fan of any pie that comes in a bar (because, hi, WAY less effort and mess, haha! 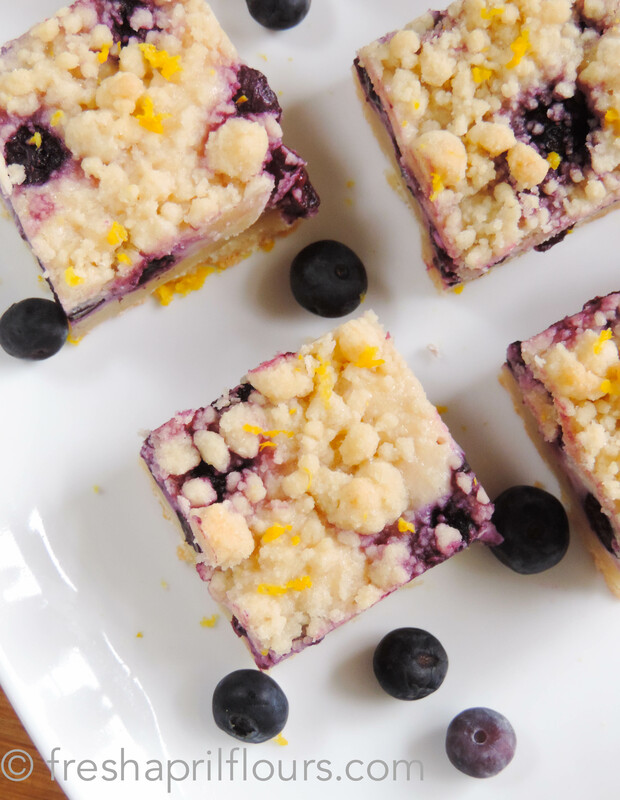 ), and these sound right up my alley, especially since they’re not too sweet and call for blueberries, which are my absolute favorite this time of the year. Can’t wait to try these beauties! Thanks for sharing, Lynn! If I want to make enough for a 13 x 9 dish, should I just double the recipe? Hi Mandy, doubling might be a bit too much. I would try 1 and 1/2 times the recipe to start. Let me know how it goes! That’s actually what I ended up doing. It turned out perfect! Very good dessert, however the recipe needs to be rewritten. I used one actual cup of Greek yogurt, instead of “one 5.3 cup of Greek yogurt.” Two very different things. Significantly increased baking time and the density of the dessert. Eager to try with the correct measures next time. Hi, Megan! Thank you for your feedback. I wrote this recipe quite some time ago, before I really knew exactly how to write them. My “or” is confusing, and should be “as in.” I will edit the recipe and hope you’ll make them again! Lynn, can you clarify the exact measurement of greek yogurt that I should use? I read “1-5.3 ounce container of greek yogurt” as use one whole container containing 5.3 ounces of greek yogurt. Is this correct? Hi, Fel– yes, that is correct. 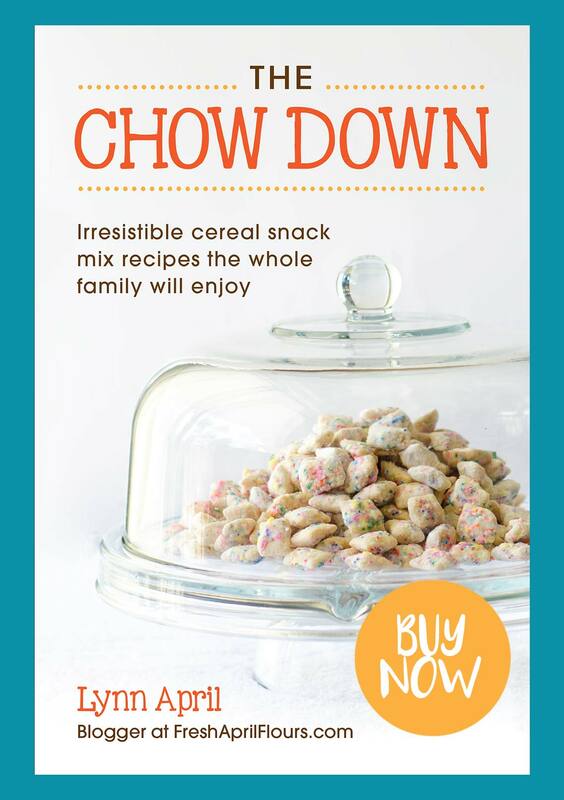 One of the containers you would buy for one-time eating! Just made these last night and had one for breakfast! Delicious! In an 8×8 pan, they are quite tall/thick. I think next time I will try the 9×9 pan to make them a little easier to hold and eat. Really delicious! 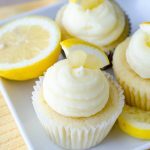 I just made these and they were a huge hit at the party! I did add 1/4 tsp of almond extract to the crust and 1/2 tsp of blueberry extract to the filling! Delicious. 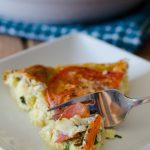 I recommend that you allow people to rate this recipe, (star rating) that appears in Google search results and you would get a lot more traffic. 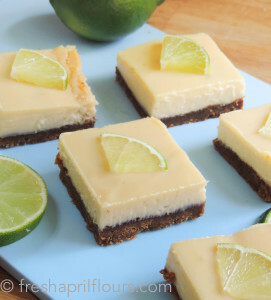 I found this recipe via Google and chose it because of the picture, but there are no ratings, which made me nervous. 5 STARS! Hey!! Normally I don’t comment on these things, but I have to tell you–I’ve made these three times since discovering your recipe a couple of weeks ago. The first time my friend and I went to a farmer’s stand (we’re from South Carolina) and made this with fresh raspberries and peaches rather than blueberries–and the lemon combination with that was SO good! Now I’ve made some for my boyfriend (he is studying for the Bar) and some for my work! These are suchhhh a hit. Thank you! Hi Tina! Thank you so much for deciding to come back to give your feedback! Your raspberry and peach combination sounds SO GOOD. I have a winter flavor coming up in November that follows this recipe quite similarly. Anyway– thank you again, and good luck to your boyfriend with the Bar! Just made this recipe tonight, and it is delicious . I love the shortbread crust and the way it contrasts with the filling. We all ate pieces when it was still warm, so I can’t wait to try them tomorrow. Definitely making again….soon. Thanks! Is the recipe correct in that you use 3/4 cup of the crust for the topping and only 1/4 cup for the bottom? Sounds backwards. Thanks! Hi Sue– there is definitely way more left than 1/4 cup for the bottom layer, so yes, the recipe is correct. You will reserve 3/4 cup of the crust for the top, but that will leave you with, I don’t know, 1 and 3/4 to 2 and 1/4 cups dough for the bottom. Let me know if you try it! I don’t have much experience modifying recipes to make them gluten free. Could you recommend? 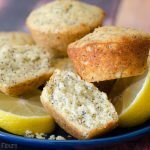 Would I do a one to one substitution with a gluten free baking mix? I think bobs red mill makes one. Hi, Karen! I’m sure a GF substitute would be fine here. I don’t like to say “just go for it” with something like a cake or a bread, but I imagine this one would be fine. Let me know if you try it out! You state the blueberries are to be unthawed – unthawed means to use them frozen? Or, are they supposed to be thawed (unfrozen)? Have you every frozen the bars? Could they be made ahead and frozen? I have not frozen them, but I imagine they would freeze well, wrapped tightly. Thaw in the refrigerator overnight before slicing into bars and serving. These look soo good! Making them right now. They smell delicious but unfortunately the crust is sinking to the bottom and not nice and crumble-y! How did they turn out, Hebah? Once they cooked, the crumble became more crust like! They turned out so good and were a hit at dinner! Thank you! Sometimes if you’re working in a warm environment, the butter can get pretty melted. I’m glad you still enjoyed them, thanks for letting me know! Hi Susan– not that I am aware of, but you certainly can, up to 2 months. Thaw in refrigerator overnight before serving! If you don’t have Greek yogurt can you substitute it orm remove it altogether? Hi, Ro! 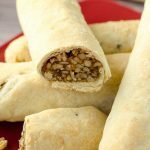 Leaving out the Greek yogurt would definitely alter the texture of the filling and not quite hold together. If you have sour cream, that would work as well. Made for a friend’s birthday this weekend! We were camping, and I made them at home the night before. They held up beautifully and were sooooo good!!! Thanks for letting me know, Shannon! So glad you liked them! 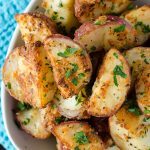 I made this scrumptious recipe and they were a HUGE hit!! I don’t eat many sweets but I couldn’t stop eating these! One thing I would do different next time, and yes there will be MANY next times, is to use the smaller frozen blueberries or 2 cups large frozen blueberries. I had to bake them for an hour and 20 minutes which was possibly due to the juice in the blueberries. Still, they came out so yummy and tasty and everyone who tired them absolutely LOVED them!! Excellent recipe Lynn! Thank you so much for sharing it !!! Hello Lynn: I publish a small, monthly tabloid newspaper in Idaho. 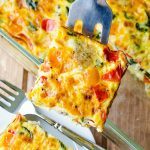 I accidentally ran across your amazing recipe and was thinking how great it would look in my recipes section for Easter. May I have your permission to publish the recipe and a photo in my March edition? I will give you full attribution, as well as a link to your website. It would also appear in my E-edition. Thanks in advance for your reply! Hi, Josie– of course. Thanks for checking first! Hi Lynn! I’m making these for my mom for mothers day and was wondering if you think they’d be okay to ship to her without putting them in some type of cooler? Hi! I’m not sure I would recommend that, as the filling is sort of cheesecake-y. I wouldn’t feel safe about that! Do you have to use the foil or can you just grease the bottom of the pan? I will be using glass pan to transport them. You can just grease the bottom of the pan if you prefer, but know that they will be much harder to cut and remove without it! Enjoy! I made these for my co-workers today and everyone raved about them! I made them in an 8×8 pan, and they were a bit thick. I’m wondering if these would work in a 9×13 pan? And if so, how would you adjust the cooking times? Thanks for letting me know you enjoyed them! They would probably work in a 9×13, but I’m unsure of the bake time. Probably start with 40-45 minutes and see where that gets you? Hi! I made these this week, but when I cut into them, the filling fell out everywhere, and it didn’t hold together. I did not beat in the sugar, yogurt, etc. I mixed them in with a spatula because your recipe said “mix” as opposed to “beat” earlier in the same instruction. If I had beat it all together, would it have whipped a little more and held together? It was pretty melty and messy, and the photos of your dessert here look pretty held together. I had it stored in the fridge and followed all the directions to a tee. Any ideas? It tasted wonderful, but I’d love for it to look a little nicer. Hi, Johanna! I’m sorry to hear they didn’t turn out for you. Since I wasn’t there, it’s impossible for me to know what went wrong, but based on the feedback from other readers, I would say that it’s likely something went wrong on your end with the ingredients. I have updated the recipe to be more clear that “mix” should be “beat,” but I am doubtful that was the problem. Did you add the right amount of yogurt? It sounds like you had too much moisture happening, as I myself (and, as I said, many readers) have made these plenty of times. I’d love for you to try again, insuring proper measurements and ingredients and letting me know if it works out better the next time! Hi, Chris! Sorry to hear they didn’t work out. While my directions say 55-60 minutes, it could take more or less time for YOUR oven to bake YOUR bars. If you inserted a toothpick into the center and it came out clean, the bars should be done. Unless you forgot an ingredient, used lower fat cream cheese, or used too much liquid, I’m not sure I can tell you what went wrong. I’ve only ever had to bake it an hour, and I’ve made this many many times. I’m not sure what else to tell you. If your toothpick came out fine, it should have been baked long enough to stay together, unless you omitted eggs completely. These are simply delicious and were such a hit at work. I chilled overnight and when I went to cut them they were very hard to get off foil. Do you allow to sit at room temp before cutting or do you serve yours cold? Thank you for recipe Everyone is asking me for it. Hmm, I’ve never really had a problem getting the foil off, but I usually use heavy duty foil which is usually a bit thicker. Glad you were able to enjoy them anyway! Made these for Easter and they turned out PERFECT. Even had to trade the lemon yogurt for blueberry. Thanks for the wonderful recipe!! Hi, I made these for Easter this past weekend and they were a hit!!! I had the same problem that it seems a few others had though. I cooked them for almost an hour and a half, and my toothpick came out clean, but my bars were still very gooey and I was not able to cut them into bars, I had to serve this like a pie. Either way the recipe was delicious!!! I added a little extra lemon to mine and it was soooo good! Will definitely make again. Thanks for sharing!!!! So glad you liked them, Aimee! I think that should work just fine, as long as it’s 8 or 9″ round. I’m unsure how bake time might affect this, so definitely check often. Let me know how it works out! I’m so excited to try these! I’m going to take your advice and make them 3 days ahead of time. Do you think I should keep them uncut in the fridge until I’m ready to serve them? Thanks! I think that’s a great idea, Kristin! Enjoy! Just because I know other people look at alterations/ substitutions- I used plain, 5% fat Greek yogurt and upped the lemon juice by a teaspoon and lemon zest by a tablespoon-ish. I also used only 2 cups fresh blueberries. They turned out perfectly. Thank you! Thanks for sharing your adaptations, Mandy! So glad you enjoyed them. These are wonderful bars. Can they be frozen? Hey, Branka! I’ve actually never frozen these before. I’d imagine they would freeze well, though. No longer than 2 months and thaw in the refrigerator overnight.